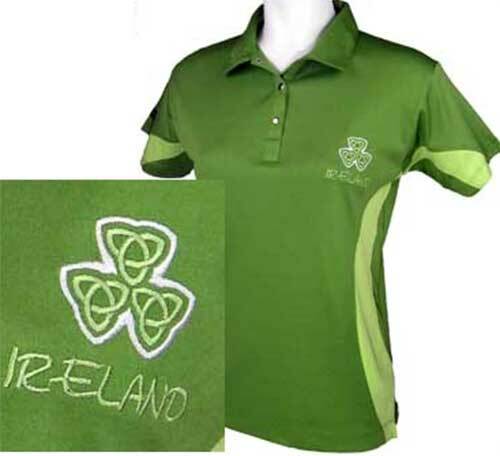 This women's Irish polo shirt features European sizing: 8-10 = small, 10-12 = medium, 12-14 = large, 14-16 = XL & 16-18 XXL. European sizing runs about 2 sizes smaller than a regular adult unisex size. For example a size 12-14 (European large) is similar in size to an adult size small. The ladies' Celtic sport shirt features a breathlite 2 layer fabric. The base layer keeps your skin dry by wicking moisture away and the outer layer keeps your skin cool in hot weather. The spring green color Irish polo shirt for women features a Celtic knot design on the high-performance,100% polyester, breathable fabric. The women's golf shirt is enhanced with an embroidered triple Trinity knot and IRELAND design on the left chest along with metal snaps and European sizing. The women's Irish sport shirt is received with a Celtic knot history card, complements of The Irish Gift House.